Last Wednesday night’s Game 7 of the World Series was one for the ages. Rajai Davis’ frozen rope game-tying home run off flamethrower Aroldis Chapman in the bottom of the eighth inning and Ben Zobrist’s clutch RBI double in the tenth convinced me it was time to reinvestigate the most crucial plays in the history of the Fall Classic. Two years ago, prompted by Malcolm Butler’s dramatic game-winning play in Super Bowl XLIX, I put up a similarly titled post regarding the plays with the biggest fluctuation in win probability within a single game of the World Series. Now, I tackle the issue that people will probably find even more interesting, which I touched up in the previous article: the plays that had the largest effects on the World Series as a whole in a given year. Thus, given the information specific to each game in a series from before about the Batting Team Win Expectancy Before and After, we need a comparable measure of Win Expectancy with respect to the series itself. To avoid confusion, the game-level values discussed in the previous post will be referred to as Win Expectancy (WE) and Win Probability Added (WPA), while the new measures at the series-level are Championship Expectancy (CE) and Championship Probability Added (CPA). Essentially, my previous post looked at the most pivotal plays in a World Series game, where each game was in a vacuum. Now we must give some context to each game and thereby apply different weights to plays depending on the Series score in games (i.e., 1-0 or 2-3). Specifically, late game heroics are obviously more significant in Game 7 than Game 1. In adding this level of context, we can rank the plays that had the largest effect on that team’s expectancy of winning the World Series. Keep in mind, for this part of the process (to keep things relatively simple), I ignored tie games (1907 Game 1, 1912 Game 2, 1922 Game 2) because they do not actually change the Championship Expectancy. I also left out the best-of-9 series that occurred in 1919 and 1920. I did so because they entail describing separate probability models from the best-of-7 series and because there were no plays in either of those Series that would come close to cracking the list of most significant plays. Now that we’ve dealt with background and semantics and you’ve refreshed yourself, if necessary, with the meanings of WE, WPA, leverage, etc., we can discuss some logistics…and no, I’m not referring to a logistic model. I am talking about a model of sorts though. 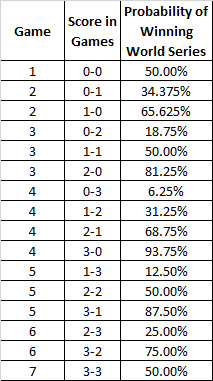 I calculated this CE for before and after each play based on the game-level WE before and after the play, using the Law of Total Probability in conjunction with the probability of winning the Series given the score in games [for example, if one team leads another 2-1 in games, then at the start of Game 4, CE can swing from 68.75% to either 87.5% (3-1 in games) or 50% (2-2 in games)]. Finally, I subtracted CE before each play from CE after each play to get Championship Probability Added. Having created my Batting Team CE and CPA columns all that was left to do was sort the plays by the greatest magnitude of CPA. Green represents a walk-off hit to win the World Series, orange means the batting team eventually lost the game and the Series, and red denotes the batting team’s CE decreased on that play. Without any further ado, here are arguably the most important plays in World Series history: those plays that swung a team’s chances of winning the World Series (altered the Championship Expectancy) by at least 25% (CPA). *Note 1: 1991 Game 7, Atlanta not only had a decrease in CP on the play, but also went on to lose the Series (so it is highlighted red instead of orange). First of all, to put these plays in perspective, looking at the selected ~49,000 plays in World Series history between 1905 and 2016 (not including the tie games and best-of-series, as explained earlier) the average magnitude of CPA was 1.29%. Compare that to the 32% average CPA of these noteworthy 32 plays. Just think: ~97% of plays in the World Series have CPA magnitudes at or below 5% and only ~400 plays saw CPA’s in double figures. Now add the fact that though these thirty-two represent a tiny sliver of all the plays, their combined WPA magnitude represents 1.6% of all championship probability fluctuation in World Series history. Clearly, most of the biggest plays in World Series history (in terms of adding to a team’s chance of winning) occurred in Game 7, as this game has the most impact, and is effectively worth the entire Series by itself. However, a few remarkably important plays, including Gibson’s walk-off home run in Game 1 of the 1988 Series and Cookie Lavagetto’s walk-off double in Game 4 of the 1947 Classic appear on this list, just as they adorned the top of the list of most pivotal plays within a single World Series game. The 2016 World Series was incredible for its pitting of the Chicago Cubs and Cleveland Indians, holders of baseball two longest championship droughts (108 years and 68 years, respectively, at the time). It will always be remembered for the Cubs’ first Fall Classic triumph since 1908 and the celebrations for the team and analytics (thank you Theo Epstein and Joe Maddon). However, this Series was also remarkable for two crucial plays in the four-and-a-half-hour rain-delayed marathon Game 7. Ben Zobrist’s double ranks as the 15th most pivotal play in World Series history given its 31% swing in Championship Expectancy. Meanwhile, Rajai Davis’ home run comes in at number 3 all-time in Championship Probability Added with a 39% CPA that took Cleveland’s title hopes from fading (14% CE) to alive and well (53%). Unfortunately for Davis and the hometown crowd, his line drive blast represented the largest change in batting team CE for a team that went on to lose that Series, taking that feat away from New York Yankees great Yogi Berra and his 3-run lead-changing home run (34% CPA) in the top of the sixth in Game Seven of the 1960 Fall Classic in Pittsburgh. Interestingly enough, that Berra home run, which ranks as the 8th most important play in World Series history (and the play that occurred earliest in a game to appear on this list), was not even among the two most significant home runs in that game! As seen in the list, Bill Mazeroski’s walk-off dinger gave the Pirates a 10-9 victory in the game and a 4-3 World Series win. His homer increased the Pirates Championship Expectancy by 37%. Not to be outdone though, his teammate Hal Smith was the real hero; Smith crushed a 2-out, 3-run bomb an inning earlier in the bottom of the eighth to give Pittsburgh a 9-7 lead, increasing the team’s CE from 29% to 93%, which represents the largest CPA swing ever at 64%. These 32 plays above represent the most game-changing events in World Series history. Baseball teams, fans, and the game itself were altered by these dramatic hits and double plays. It is interesting to note, however, that there have been plays in ALCS and NLCS Game Sevens as well as in the regular season that had drastic effects on Championship Expectancy as well. 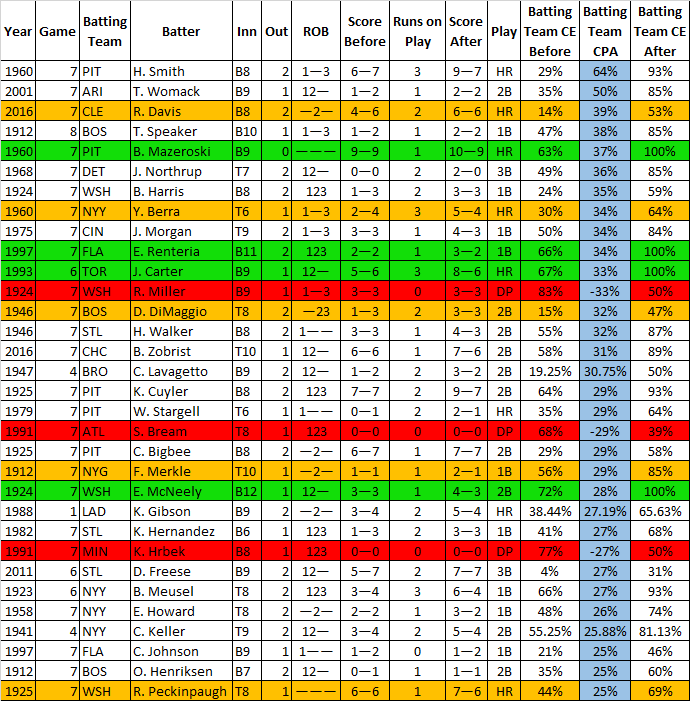 HSAC and I plan on updating this as things change in the future and I also plan to document that players who had the best World Series careers in terms of WPA and CPA. For now, here’s to hoping for more unforgettable October and November memories and World Series-defining plays. *Note 3: Here is the table of a team’s probability of winning the World Series (Championship Expectancy) at the start of a game, depending on the Series score in games. This model assumes that each team has a 50% chance of winning each game, which is reasonable because the home team in World Series games all-time have won ~53% of the time.